Crazy thunderstorms may be putting a damper on your beach volleyball games and backyard BBQ’s, but that hasn’t stopped anyone from drinking and eating our favorite summer foods! Be aware though, some of our favorites can leave your teeth stained, and may even be wearing away your enamel. Take a look below as to what to look out for! While most teeth feel nice and smooth, the reality is that all teeth have tiny pits and grooves all along the surface. When you drink coffee, some of the black coffee particles get stuck in these pits and grooves, causing discoloration. Drinking lighter colored coffee–with sugar and cream–doesn’t help either. Not only does the coffee itself wear away at the enamel, causing more tiny grooves for food particles to get stuck in, but the sugar and cream also attract bacteria, which can further worsen the staining. Nothing says summertime quite like passing around some cocktails! While wine might be one of the major purchases on your BBQ list, you may want to consider a more smile-friendly alternative. Both white and red wines can cause dental staining, and white wine’s acidity has also been known to damage tooth enamel. If you can’t say no to a glass of wine, then we recommend drinking it over a shorter amount of time rather than sipping it, so your teeth aren’t exposed to the damaging beverage too long. Need a quick fixer-upper to get rid of those stains? Wine wipes are an AMAZING way to clean up those purple lips! Take a look below, as Dr. Jessica Emery describes her love for them! Summertime tends to be popular for fruit-filled pies. Strawberry & Blueberry picking is such a fun activity to do! 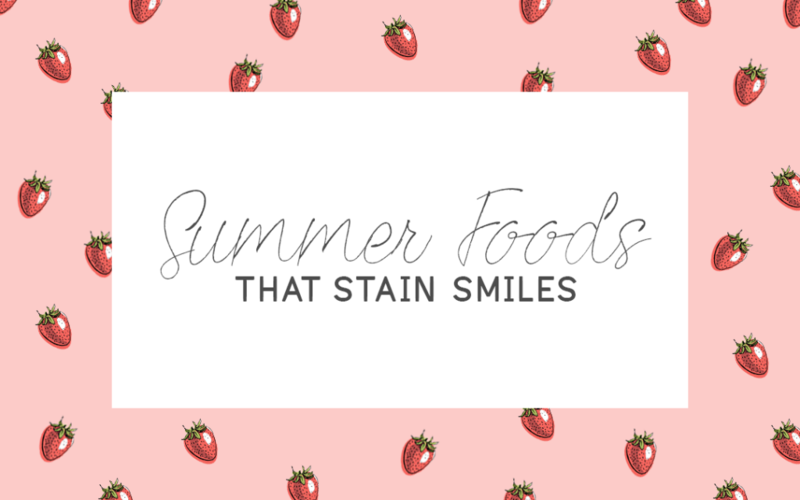 However, these summer foods, like berries and dark fruits can stain teeth. Also, the acidity can damage tooth enamel, which can weaken teeth. If you want to keep that sparkling smile bright but need something sweet, opt for chocolate or try out some luscious peaches, apricots, or Apple, which won’t cause the same stain problems that berries will. After indulging in some yummy drinks or exquisite foods, a handy tip to know would be to always rinse after. Whether that be with water or a little bit of mouth rinse, it can wash away any potential staining & help fight cavitites. follow us on Facebook, Instagram, Twitter, and Snapchat! (@DRJESSICAEMERY).